This wide varitey of habitats and life zones is the reason we have had such a high rate of success (77% rifle) the past fifteen seasons. Regardless of the weather, we have been able to get into the elk - cause we have land - high, low, and in between. Our team of guides and cooking/creature comfort men are really exceptional. They care about our clients in an honest, sincere manner that is reflected by the fact that each season we have over 65% repeat clients. As for the 35% of new clients, more than half of them come out with repeat clients. My guides are all adult men who range in age from 25 to 52 years. The average age of our guides is 39.6 years. Also, your guide will know the majority of our ranches as they have worked an average 7 1/2 years for The Brand. I think I have made it clear that you will not be getting an 18 year old guide that was hired out of a saloon the night before your hunt. Rather, a mature hard working professional guide, who received his guiding schedule in June. My cooks and camp jacks are cut from the same cloth as the guides. They will accomodate your every creature comfort need the best they possibly can. Our cooks have worked for The Brand an average of 8 years and average 40.3 years in age. I was born in western Pennsylvania (Pittsburgh vicinity) and spent the first 26 years of my life in the area. I met my wife Colleen in college, and after our graduations and wedding, we headed west. Now, 29 years, we reside here on our small ranch in the San Juan Mountains of Northern New Mexico, near the Colorado border. For the past 29 years I have basically made a living in two ways; commercial fur trapping (14 years) and outfitting (15 years). My trapping career was a great run that started in the early 1970's and took me to twenty-one states long-lining for prime pelts. 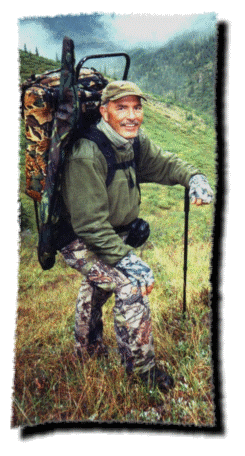 Along the way, I developed a line of trapping lures and equipment and wrote four books on the subject. Today, my trapping business is much smaller, but is still alive and well. Then in the mid-eighties the trapping industry was brought to its knees by the well meaning, but misguided people of the anti-fur movement. Why anyone would not want to make use of a beautiful, natural, and renewable resource is a question that still haunts me to this day. Well, by 1987, Colleen and I have three children and one on the way, and I do not have a viable income. I look around and decide to stay in the woods, choosing the second most politically incorrect profession known to man. So Milligan Brand Outfitting and Guide Service, Inc. is born. Since those humble beginnings in 1987, my outfit has grown to one of the highest success outfits on the continent. The reason for this success is not only the great staff, the terrific hunting grounds and the concerned outfitter. The success is based on people who love their jobs and take pride in rendering their clients a value for their hard-earned dollars. Couple that with the "Brand" men being people persons, and that spells success in a nutshell. Our goal every week, for every client, is to "meet or excede expectation!"